The Prem Rawat Foundation (TPRF) is expanding its Food for People (FFP) program in Ghana to serve nutritious daily meals to an additional 110 disadvantaged children. 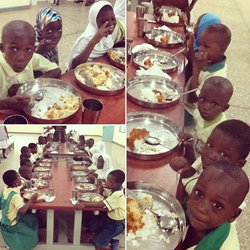 Children from the Aisha Bint Khalifa School enjoy their first meal at the Food for People facility in Ghana. The nutritious food provided by the kitchen is the obvious reason for the steady increase of students at the school. My children are healthier, and now I can save some money. The model feeding program operates in India, Nepal and Ghana, and is serving nourishing food to thousands of children and ailing adults in need. In 2015 the TPRF program provided more than 304,500 meals to people in poverty-stricken areas. With a recent expansion in Nepal and the newest growth in Ghana, TPRF is on track to significantly exceed that number in 2016. Since the Foundation opened its first FFP kitchen in 2006, the program has had remarkable results improving health, increasing school attendance, achievement and growing local economies. In the small mining town of Otinibi, Ghana the expansion comes at the request of administrators at the Aisha Bint Khalifa School to let its students eat daily lunches at the nearby FFP facility. Most of the pupils there are orphans and were previously being fed haphazardly, often by teachers who paid for student meals out of their own pockets. Aisha Bint Khalifa students and faculty began eating at the state-of-the-art facility on May 10, expressing excitement and appreciation as they dined on local cuisine. Several of the children also said they thought the food was tasty and expressed appreciation for being part of the program. Aisha Bint Khalifa students are joining a much larger group of children at the dining tables from Otinibi Basic School who have been eating at the facility since it opened in 2012. Since then, enrollment at the school has doubled to more than 700 largely because of the food program. Earlier this year, a range of students, parents and officials celebrated the grand opening of three new kindergarten classrooms that were badly needed to accommodate the increase. The Prem Rawat Foundation is a U.S.-based nonprofit organization that strives to address the fundamental human needs of food, water and peace so that people can live with dignity, peace and prosperity.